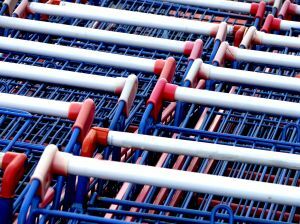 A recent Massachusetts shopping injury is turning to a lawsuit for proper compensation. The accident happened back in 2006 when a Massachusetts woman was severely injured while picking out Christmas gifts for underprivileged kids at a Husdon Walmart. The woman was lending her heart out for Christmas in December of 2006 and was giving her time and donations to the needy kids in her neighborhood. She saw an item that was on her Christmas list on the top shelf of one of the shore’s aisles. She climbed nearly 2 feet and was still unable to grab the item. When she tried to jump back down to the ground, a ring of hers got caught on a metal latch of the shelf. As she fell to the ground, she “stripped the skin and muscle,” according to Nausha Telegraph. Her ring-finger bone was entirely exposed. Our Boston premise liability attorneys refer to this injury as “degloving.” This is when a hand-related injury peels the skin from the bone. Since the injury, the woman has been through six different surgeries. In the end, the best the doctors could do was move the pinky finger to the ring-finger spot and remove the ring finger. Only her index finger and her thumb have any feeling on that hand. The woman is suing the company because she believes that the Walmart failed to keep the store properly and safely maintained. She’s seeking an unannounced amount of compensation for the loss of her ability to work and for the loss of enjoyment of life. When placing items in a store, employers and supervisors are required to stock products in a fashion that is safe for both workers and for costumers. Irresponsible shelving habits can increase the risks of a serious injury and can result in a costly suit. -Be sure that all shelves and racks are installed in accordance to the manufacturer’s instructions. Never attempt to alter a shelf’s design. -Make sure to display the limits for shelf’s size and weight limits so they’re not over packed. Overstocking a shelf greatly increases the likelihood of a malfunction or an accident resulting in injury. -Make sure that all items on your shelves are properly and safely stocked. -Always make sure that the weight on the shelves is evenly distributed. As the holiday season approaches, residents will be hitting the stores hard in search of great sales. Shoppers are urged to keep an eye out for dangers in shopping centers, stores, in parking lots and on elevators. If you see a hazard in one of these areas during a shopping trip, you’re urged to contact the appropriate management team. These companies have an obligation to keep customers safe. These safety efforts need to be increased during the holiday shopping season when stores are packed with bargain-hunting shoppers. If you or a loved one has been injured on business property in Massachusetts, contact Boston Injury Attorney Jeffrey S. Glassman for a free and confidential appointment to discuss your rights. Call 877-617-5333.